Lee Collins (right) and Abe Greenspan are the founder of TahoeLab. 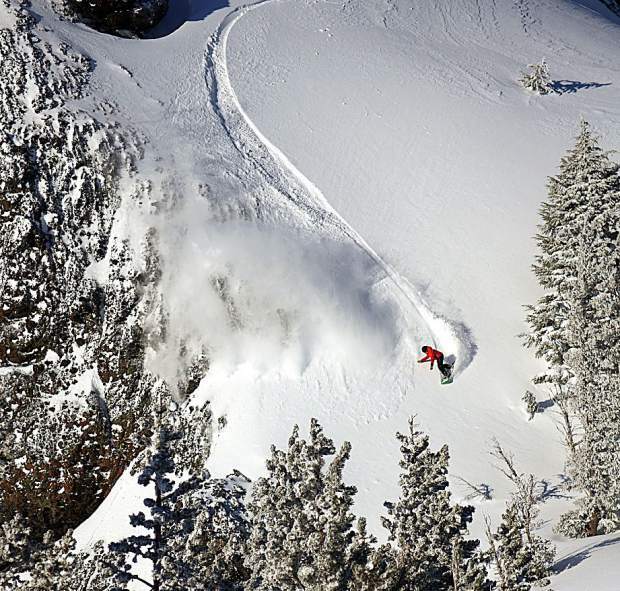 Meyers' Abe Greenspan cruises in powder during a backcountry run. 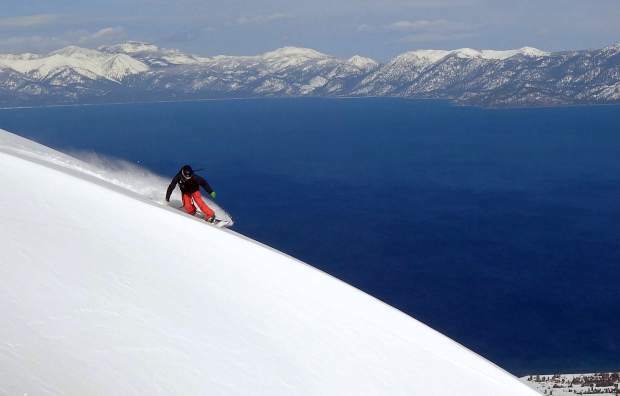 Lee Collins, president of TahoeLab, makes his way down Mount Tallac. 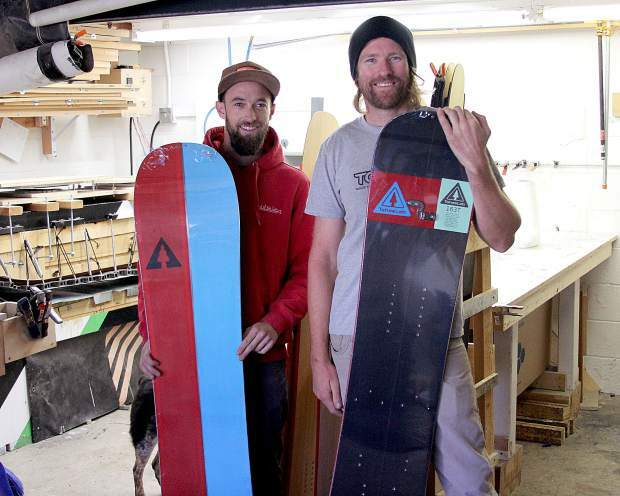 Abe Greenspan and Lee Collins formed TahoeLab in 2013 because they were less-than thrilled with snowboard choices offered by the mega brands, especially splitboards. The duo never intended to grow TahoeLab as big as Burton, K2, Lib Tech or others. They mostly just wanted to be able to pay rent for their 600-square-foot shop. 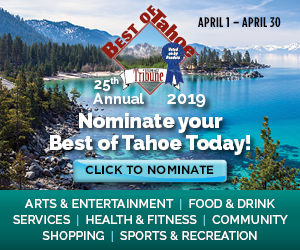 “We’re big into snowboarding, we’re big into the backcountry and we were dissatisfied with what was out there so we started making our own,” said Collins, a 40-year-old Yale University graduate, Tahoe resident since 2000 and president of TahoeLab. The longtime friends, who both grew up near resorts, Greenspan in South Lake Tahoe and Collins in Maryland, ride as much terrain as possible when snow sticks to the deck. 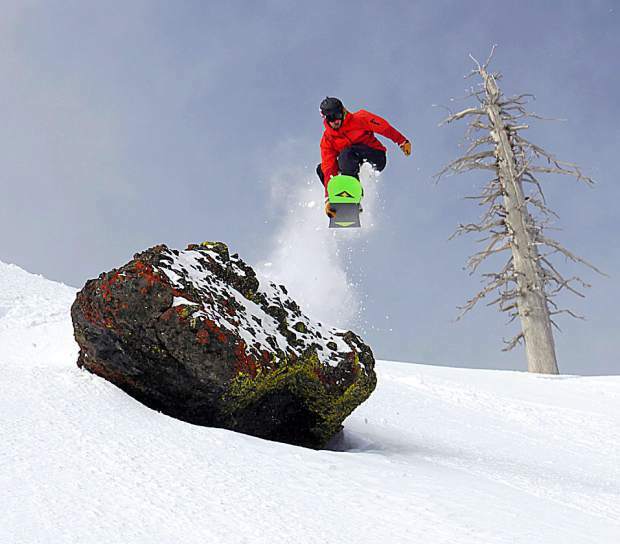 They slay powder, crud and ice on iconic slopes in the Tahoe Basin and elsewhere about 100 days out of every season. The 30-year-old Greenspan, having conquered the Tahoe Ten (a feat that involves climbing and riding five Tahoe Basin peaks, a combined 10,000 feet of elevation gain, all in a day) is an extreme rider. He also competed in boardercross for Team USA for a few years and he, along with Collins, competed on Daron Rahlves’ Bonzai Tour. Greenspan and Collins have toured the backcountry together for about 10 years. They’ve seen firsthand the explosion of backcountry popularity and they’ve also used many different types equipment. Heading into TahoeLab’s fifth winter season, they feel like they’ve dialed in the snowboard and ski-making process and are proud of their locally-made products. 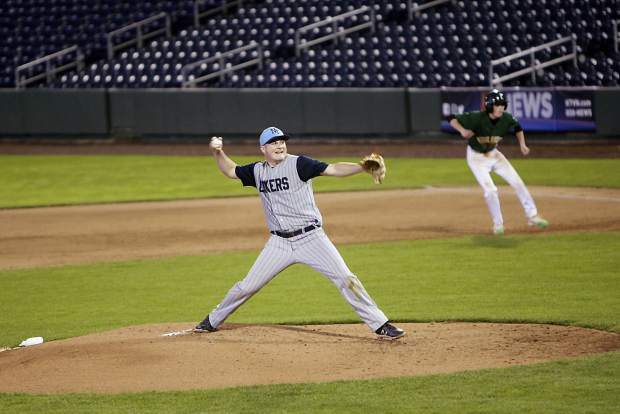 The challenge at first for the small business was perfecting the manufacturing process. Building the exact snowboard or skis again and again proved to be difficult, but over time that was solved. Greenspan is the company’s only full-time paid employee and gets part-time help from Meyers resident Jacob Daiek. They made 70 to 80 snowboards last year and have ramped up production this season with plans to produce 100 to 120. They make about five snowboards per week and it takes about 12 labor hours to complete each one. TahoeLab uses top-notch materials, like a full bamboo core, a minimum of two sheets of carbon fiber in each board and high-quality epoxy. They make boards for more aggressive, big mountain riding and durability. They also make more lightweight recreational boards and skis. The challenge they face now is how to market their products. Big companies have advertising budgets and marketing specialists. 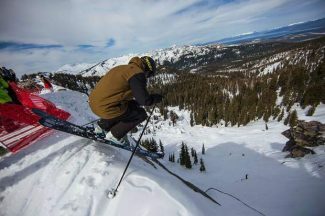 One way they get the word out about their equipment is to have professional riders use TahoeLab snowboards on the Freeride World Tour, including Greenspan’s friend Jonathan Penfield who finished second on the circuit last season. Lake Tahoe Community College Wilderness Coordinator Dave Reichel uses TahoeLab snowboards in his classes. TahoeLab demo boards are also available at The Backcountry store in Truckee. But if customers want to buy a product, they need to go to the source. TahoeLab, which also has office space in Zephyr Cove, can also customize and personalize boards and turnaround orders usually within a couple of weeks. The company has partnered with the Sierra Avalanche Center and preaches to their customers to be educated, find mentors, or do whatever they can to make backcountry travel safe. People interested in TahoeLab can visit the company’s website at tahoelab.com or follow them on Facebook and Instagram.